JTable looks a little rough around the edges straight out of the box. With a couple of tweaks, though, we can make it fit in better on the Mac (and Windows too). So what’s the most glaring problem here? Well for one, the table header doesn’t extend to the scrollbar. Second, there isn’t a scroll pane corner set on the upper right corner (in a perfect world, the scroll pane corner would merge into the table header, but we’ll let that go for now!). Below is the implementation. Note that I’ve done the striping in a custom JViewport because it’s much easier that way. Also, the selection intentionally doesn’t span the entire width of the viewport, as the native table selection doesn’t do this. // grid lines over the entire viewport. * of the right-most column if neccesasry. * x for the given width. * row positions of the given JTable. // but for now, it works fine. // rows in the table, start the counter at 0. // paint the column grid dividers for the non-existent rows. // increase the x position by the width of the current column. At first glance, it appears like a dirty hack, but the single threaded nature of Swing means the getBackground hack only comes into play when called by the renderers (and only when needed). It’s primary advantage though is that it’s not using any transparency to accomplish the striping. I can’t say for sure precisely what impact having a transparent renderer will have, but I’d watch out for individual cell repaints in odd rows triggering a whole JTable repaint. Performance in JTable isn’t everyone’s problem, but if it is then these type of enhancements can make all the difference. Good suggestion. There is one wrinkle though — that technique won’t work if you want the row striping to extend to the edge of the viewport. You could override getScrollableTracksViewportWidth() and return true when the columns don’t fill the viewport, but then the columns would be strectched rather than given their preferred size. Also, even if you overrode getScrollableTracksViewportHeight() to return true when there weren’t enough rows to fill the viewport, the renderer wouldn’t be called for the non-existent rows, and thus the striping wouldn’t extend to the bottom of the table. At any rate, your suggestion in many cases will work just fine! Thanks for the feedback Brendon. see the code under heading “Region 3”. Nice…this is certainly a common problem. Creating a better JTable? How about reusing a better JTable: JXTable from swinglabs. As far as I can tell, JXTable does not address the issue I was talking about here, namely filling the empty JTableHeader space — maybe your comment is keyed off the title rather than the content of this post. Even if JXTable *did* support what I talked about, not everyone can pull in SwingX as a dependency, that is, some production environments are pretty stick. Also, any developers with an extension of JTable may not be able to easily cut over to JXTable. 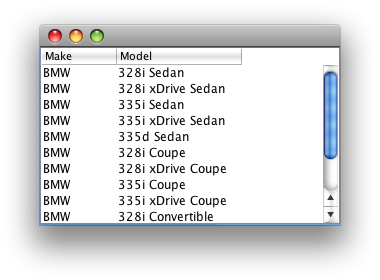 you are right JXTable does not address issue with filling the empty space in a table with autoresize off. I am not sure what makes you think that auto-resize off is the default on “most” platforms? Which combinations of JRE + OS did you verify that with? It does address the issue of the empty corner, by providing a useful column control that allows selecting which columns should be visible (among other things) as well as the alternating row colors. I realize your blog does not target reusable components necessarily but “digging through the dirt” of UIs and I understand your point about the problem of integrating 3rd-party libraries in some environments. My point is just to encourage people to reuse powerful components (if possible) instead of coding things from scratch, so I am suggesting an alternative (which still extends JTable, so part of your solution still applies). 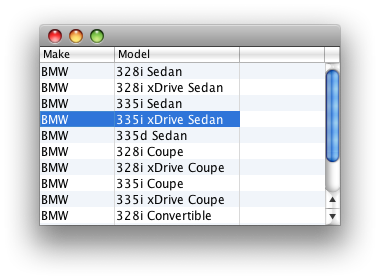 Most *native* tables on both Mac and Windows don’t auto-resize columns by default (e.g. Finder, Windows Explorer, iTunes etc.). I fully sympathize with reusing existing components. However, the aim of this blog (much of the time) is to provide insight into fixing targeted problems. That said, I think it is valuable for you and others to highlight fuller more vetted reusable solutions via the comments — I do appreciate it! Ah, native tables. Misunderstanding on my part, thanks for clearing it up. Nice one, but one thing your code doesn’t seem to handle is variable row heights. I would suggest to replace fTable.getRowHeight() by fTable.getRowHeight(currentRow) for none empty rows only. However this approach might be suboptimal on the performance point of view compared to yours. It should be checked. Good point Jambo — I’ll play with that idea and see how it affects performance. Great work! It’s awesome how you pay attention to details. Thanks Roberto…the details are everything! Will this code be any different ? My code uses the default header renderer to paint the empty header area, so if the default header render on Vista paints that type of header background, you’ll be all set. Thanks for the links. I always love seeing what other developers are doing with Swing! What I am interested in is functionality. A japanese OSX user told me that cell editing doesn’t work as expected. He tells me that moving to a new cell (e.g. by tab or arrow keys) doesn’t allow him to directly edit cells. At least I can easily do that. I move to a new cell and directly start typing. He has to select a cell with the mousepointer do do that. I’m not sure what your referring to — in a Java table on my Mac, if I move to a new cell I can start typing to enter edit mode. I haven’t tried it on Windows, but I’ll give it a shot and see what happens. You will have no column headers since you’ll need to add the JTableHeader manually if you are not using a JScrollPane to wrap around the JTable. Your absolutely right! Nice catch. I would prefer that the stripes are only painted for the rows not the full viewport. but your suggested modifications fill the first column till bottom and nothing else. I want the stripes painted for all columns. What I do not want is the viewport to be filled with stripes where there are no rows. I’d suggest that you just override JTable.prepareTableCellRenderer if you don’t want to fill the viewport. That would be the most straight forward solution. My solution is intended to address the problem of painting the entire viewport. Obviously the table grid should also not be rendered to the bottom. Just to the bottom of the last cell. How about not hijacking this discussion and asking the relevant question on the proper SUN java forum ? Thanks for the fixes jrico! Thanks for the tip. I fixed the scroll problems by modifying the code in paintStripedBackground() with a translation on the graphics object. The key is to align the painting of the StripedViewport with the view position, since it is no longer just a simple background color. Don’t forget to correct the translation after paint the stripes or the table will be misaligned because it doesn’t need the graphics translation. Repaint is probably a little blunt, so there could be some refinement there, but the main idea is that when the JScrollPane (and really it is the UI class calling it) does a scroll it calls the setViewPosition() in the JViewport. JViewport then creates the graphics object to repaint the view, but it doesn't repaint itself, which with a static background is okay, but StripedViewport's background is not static. Thanks again for the great work and I hope these fixes will be useful to someone else. One other note, I changed where my stripe colors come from–just so know it won’t just copy and replace the existing method perfectly. Thanks for the fixes Martin! If you'd like to help support the continued development of Mac Widgets for Java, click below to donate via PayPal.